Manufacturer & Supplier of Forged Machined Component. 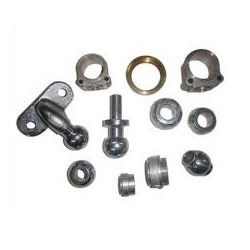 These offered products are available in market with minimum cost and low maintenance..
With the valuable assistance of a skilled team of professionals, we are offering an extensive range of high quality Forged Machined Component. Illustrious for their remarkable features, the offered range is highly demanded in the market. In order to meet varied demands of clients, these are made available in different dimensions and the best suited to be used in the electrical industry.